Lucky for me, once I start on a project, I get ideas. Unlucky for me, once I start a project, I get ideas. Instead of a plain ol' river, I decided to make a fountain to feed the river from one end. 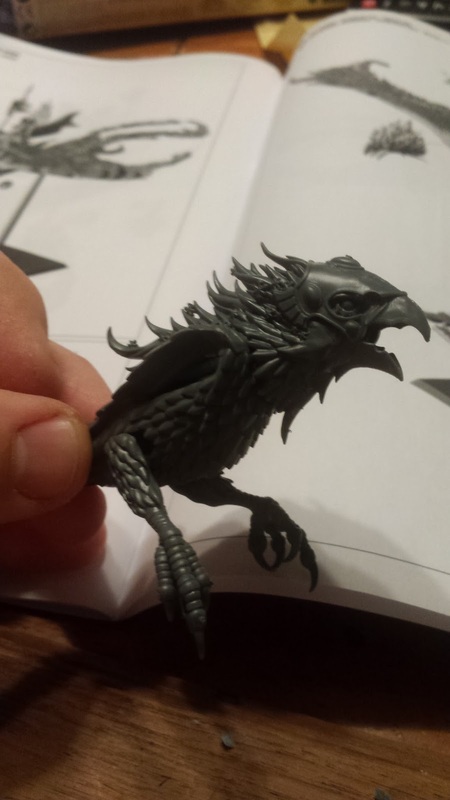 A few weeks ago I got a Flamespyre Phoenix and have been trying to think of a project for it, since I probably will never play Age of Sigmar (not by choice). 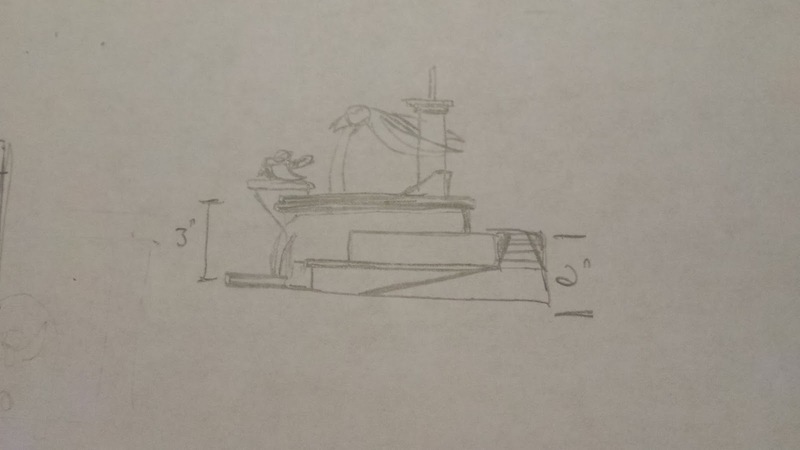 So I decided to chop up the Phoenix and use it as part of the fountain, with a mage or cleric in the pool fighting it. 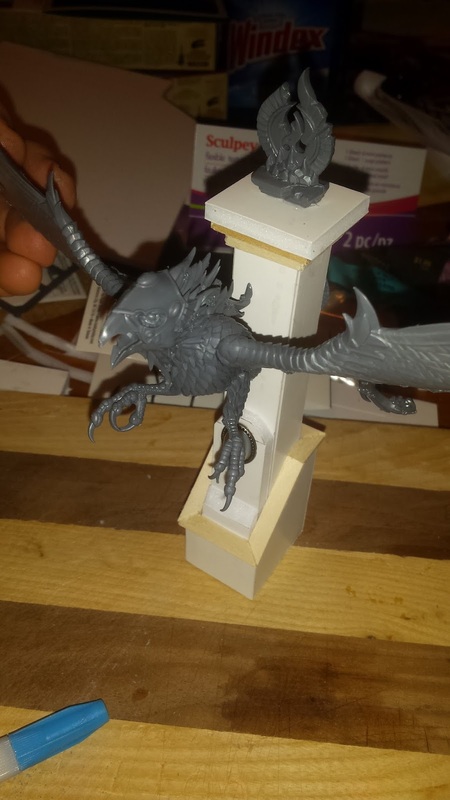 Friday night, I assembled the Phoenix and modified the legs to face forward (they still need green stuff on them though). 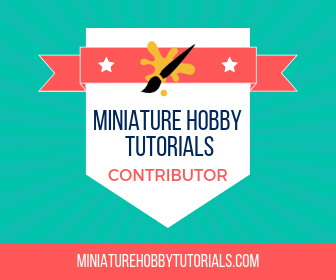 Saturday, after work I ran to Hobby Lobby and searched for pieces parts for the fountain and ran across some really sweet finds! First off, I snagged a bunch of wood pieces for various things, like statue bases and plinths. But that's normal for a trip to the craft store. 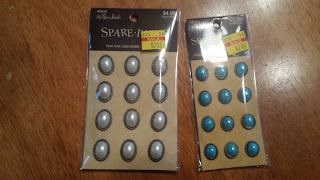 The really sweet find wasn't until I wandered into the scrapbook section and found these darlings. They actually look a lot like Games Workshop style gems and I knew I had to snag them. They'll make excellent additions to all kinds of things. 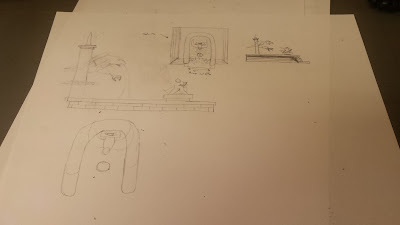 Once I got home, I started work on the fountain and worked on it pretty much all night. I started with the plinth for the bird and made it out of foamcore board. 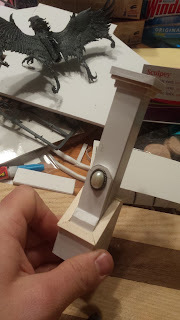 The plinth itself is 3/4"x3/4" to allow it to miss the wings. I decided to get fancy and made the base of it angled and added a raised section on the face of it. Here I added on of the gems I had just bought. The top of the base and t he underside of the top are all trimmed out with wood. I have to say, I love my little hobby saw and miter box. It makes these projects so much more professional looking. Possibly the best hobby purchase in the last 2 years. The plinth needed some extra love tho, and I couldn't think of anything else to add to it. That is, until I dug into the Phoenix's box and found the back of the saddle and the base for the flight stand. Both of them were perfect and since they are part of the same kit, the fit in really well. That's it for now. I just need to green stuff some patches of feathers onto the legs and attach the phoenix to the plinth. 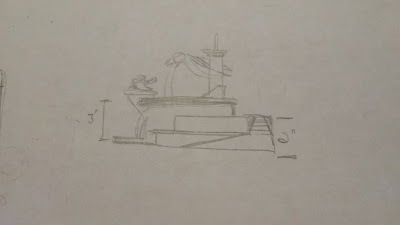 Then I can figure out the measurements for the rest of the fountain. The way it's all planned it should look something like the drawing below when it is all done. The plan is to make it usable anywhere on the table, be it edge or in the field.